A bright green emerald shines between four diamonds on an 18ct yellow gold band. Perfect as a gift or as an engagement ring, this beautiful piece can represent your true love and commitment, as well as the promise of a wonderful future together. 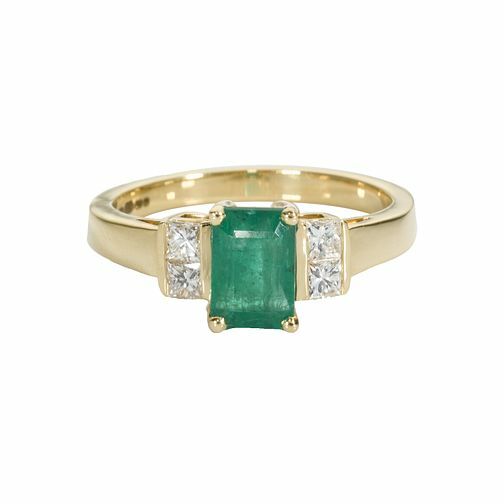 18ct gold emerald and diamond ring is rated 4.9 out of 5 by 7. Rated 5 out of 5 by Anonymous from Timeless I got this as my engagement ring 9 years ago and I absolutely love it still. I didn’t want the typical diamond ring that everyone has and am so glad my husband decided on a stone I love. I love my ring. Rated 5 out of 5 by Anonymous from Love this ring I got this ring as my engagement ring 7 years ago and I love it as much now as I did then!! It is a timeless piece of jewellery that I will never get tired of! !